If you want to close out the year with some non-profit learning – take a look at our round-up of free webinars for December. Even though it may be one of the busiest months of the year, we’ve still found more than 23 free non-profit webinars available this month. Topics include: Last Minute Fundraising Appeals; Inbound Marketing and Millennial Donors; Leadership Buy-in for a New Era; and a couple on trends for 2014: Idealware Looks to 2014; and Nonprofit Communications Trends, Priorities and Goals: Dive In and Plan Next Year. You dream of a strong, vibrant community and you have a sense of how to make it real. But do you know how to rally the funds needed to connect vision to action and truly support your cause? Join the editor of best-selling Nonprofit Management 101: A Complete and Practical Guide for Leaders and Professionals, Darian Rodriguez, as he shares practical, tactical solutions from his book that can and will help you get dollars in the door. This Network for Good webinar will provide concrete tips and tools to take advantage of individual giving, foundation grants, and online and peer-to-peer campaigns, just in time to give those year-end efforts a last minute boost! The Millennial Generation does not want direct mail from your nonprofit, nor do they want generic communications. To get to these early donors, 84% of which donate or want to donate online, you’ll need to earn it through transformative content that effectively tells the story of your cause. • Why a strategic plan for volunteer engagement is important. • How to incorporate key components into a strategic plan. • How you can use a strategic plan to communicate with organization stakeholders. • How creating a strategic plan can elevate the work that volunteers do in your organization. Did you know year-end donations make up 30% of giving for the entire year? With such a small window to reach those year-long fundraising goals, the success of your year-end appeal is crucial. Join Network for Good's fundraising expert, Caryn Stein, for a free Nonprofit 911 webinar as she guides organizations through the most important ask of the year. You know that your organization needs to be telling more stories. But you keep facing resistance from leadership at your non-profit. Maybe you’re a non-profit executive who wants to start telling stories, but you don’t know where to start. Sound familiar? If you’re like most of us, you’ve probably struggled to collect your non-profit stories at one point or another. How can you whip up a successful grant proposal? You’ll need just the right proportions of research, planning, drafting, and editing. And don’t forget to garnish with tasty feedback and a dash of good timing! Half of the chief development officers interviewed are planning to leave their position. For nonprofits with budgets of $1-10M, it takes an average of 8-10 months to hire for those positions, as well as other executive functions. Only 25% of those hired for executive director and other executive functions will stay in their jobs more than five years. In reaction to this culture shift of turnover and gaps in leadership, many nonprofits – large and small – are using consultants as short- and long-term solutions. Determining if outsourcing your leadership on a short- or long-term basis is a good fit. Assessing the current state of the outgoing leader’s responsibilities and reallocating resources to keep moving towards the fundraising goals and mission objectives. Relationship management of your board and donors during transitions. It’s the time of year when people are wrapping up their year and planning for the year ahead. What are going to be the most important priorities for nonprofit communicators next year? What are the most (and least) important communication channels? In this GuideStar webinar, Kivi Leroux Miller, president of NonprofitMarketingGuide.com, will share the biggest challenges nonprofits will be faced with while implementing their communications plans, and what excites and what scares nonprofit communicators about the coming year. She will also provide a sneak peek of the 2014 Nonprofit Communications Trends Report results, which will be released by NonprofitMarketingGuide.com in early January. That's it for this month. 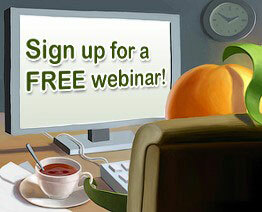 But this round-up of free non-profit webinars is a regular monthly feature compiled by the Wild Apricot Blog. You can subscribe by RSS to get updates by email, so you’ll be sure to catch next month’s webinars, as well as other great resources for associations and non-profits. If your organization offers a free webinar that would be of interest to non-profit, membership or volunteer-based organizations and you want to include it in next month's post, please email a brief overview (like those above) to lori@wildapricot.com no later than December 16th. Kathy: So glad you found the webinar round-up helpful. This is a monthly feature, so you can sign up for our RSS feed for regular updates.